It is finally warm enough to get the bulk of our veggies in the garden. Our first round of peas have been in the ground for a few weeks now and they are looking good. 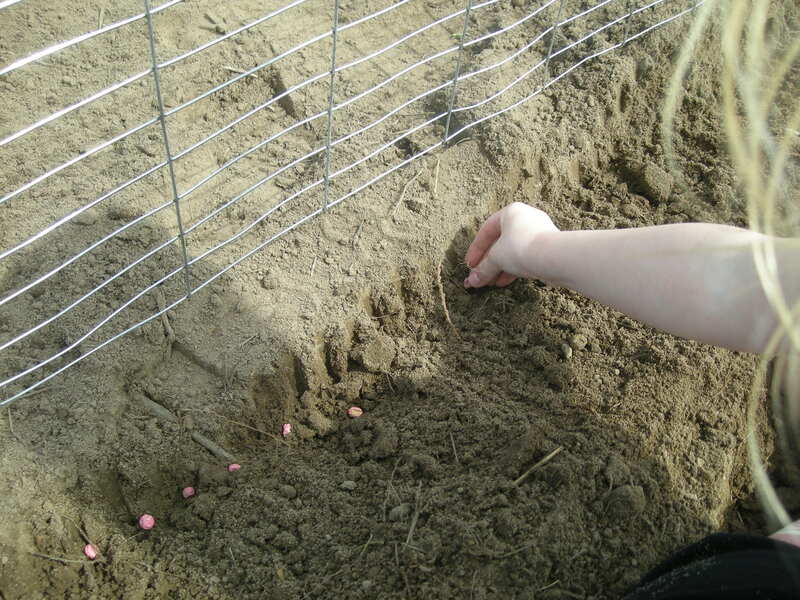 The girls planted the rest of the row today so we should have two good harvests. Today we got the plants out of the green house and by the end of the day most of them made it into the ground. Onions – I don’t think I had any clue how time consuming these would be to plant. The instructions had me plant them in a flat in the greenhouse but this meant I had to very carefully separate all the roots before putting them in the ground. It took me a long time to do our one room but hopefully they don’t have too much transplant shock. 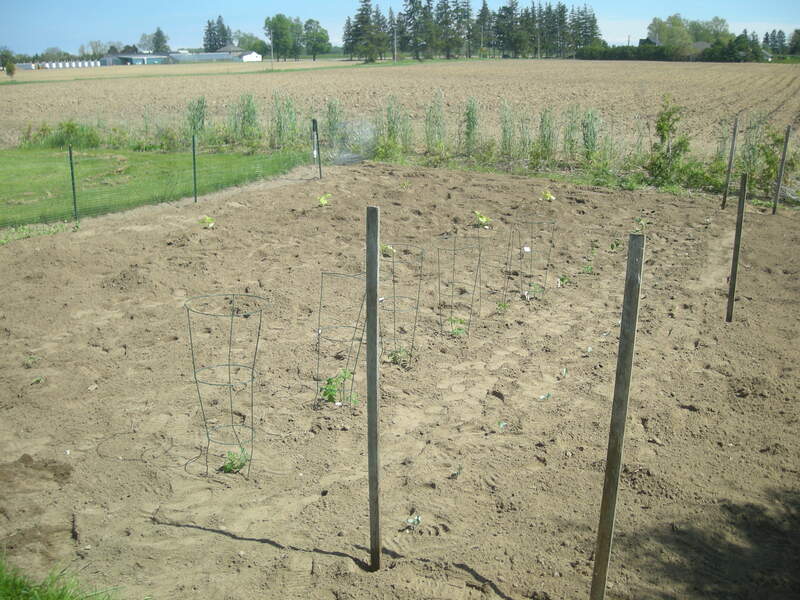 Beans & Carrots – These aren’t in the ground yet. It is still too early for carrots and my dad was going to bring us his leftover bean seeds and forgot. Hopefully the beans are in the ground by the end of the week. Broccoli – Again these were in flats and I learned quickly they have extensive root systems. 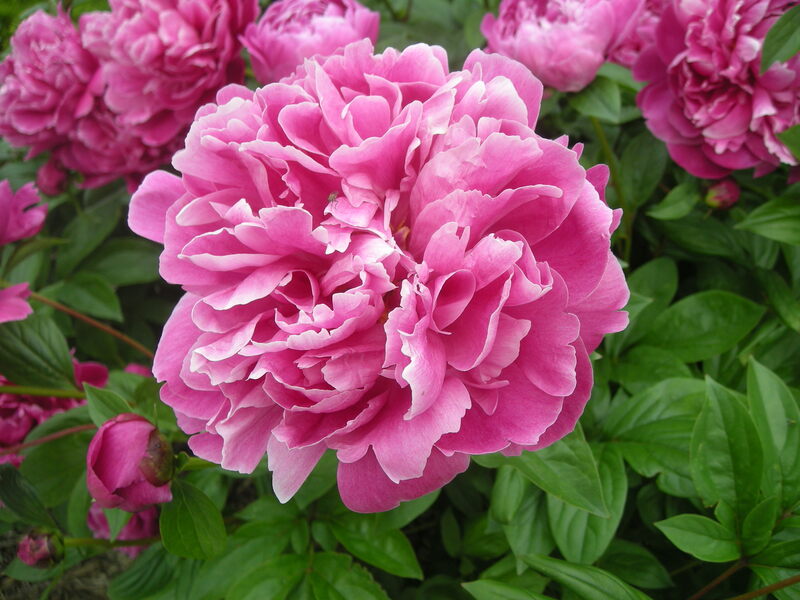 I carefully separated them and planted them in the garden. I have a lot left over so hopefully I can find a good home for them (in someone else’s garden). Tomatoes & Peppers – As this is our first year using the greenhouse we didn’t want to overwhelm ourselves. The kids and I heading to our local nursery and purchased some tomatoes and peppers today. I can’t remember all the varieties but will check the tags and put them in a future post. I did have one slicer tomato plant, one grape and 6 romas. Pumpkin & Cucumbers – I had a lot of these plants aswell. We decided on 3 hills of the pickling cucumbers and 6 of pumpkins. I really want to make lots of pickles but the kids love pumpkins and I can use them with my kindergarten class in the fall. I also have lots of cucumber plants left looking for a good home. Watermelon – Still too early and the plants are still very little. Here is what it looked like after planting today. I am hoping to post a picture at least every 2 weeks to show our progress. So we have done some more work on our garden since my last gardening post and I thought I should give an update. Everything is growing nicely in the greenhouse an we have had no more falls in the water. Mid-April it finally warmed up and dried out long enough for use to plant our peas. We have planted peas for the past couple of years but never have used a trellis to help them grow. This year I wanted to do it properly. 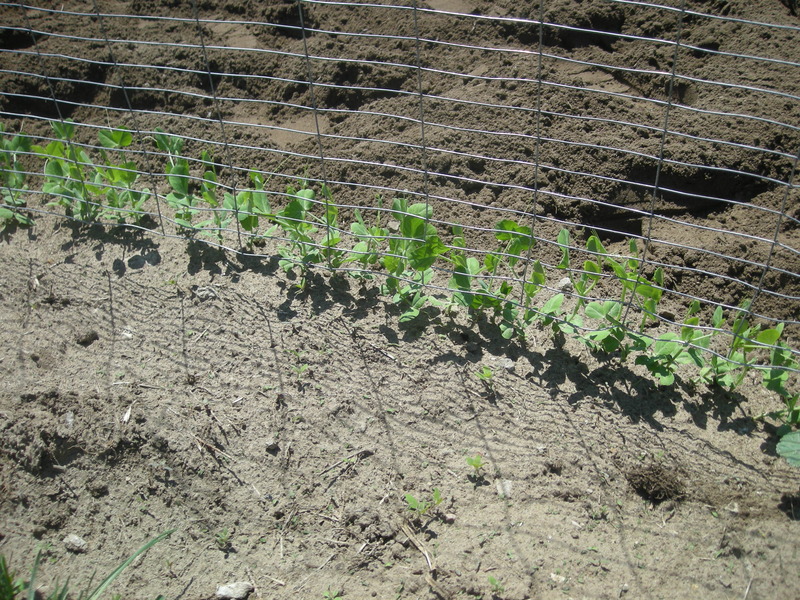 I found a great post on the blog My Crazy Life as a farmer’s wife with great tips for planting peas. She suggested using hog/cattle panels for a trellis. I headed down to our local TSC with my dad (who is also my handyman) and we found a rabbit fencing that seems like it mike work perfectly. I will let you know how it turns out. It cost me a bit of money (around $30 including the posts) but I hope to use it year after year. This was our first day out in the garden with the girls and we quickly learned that they love digging holes. 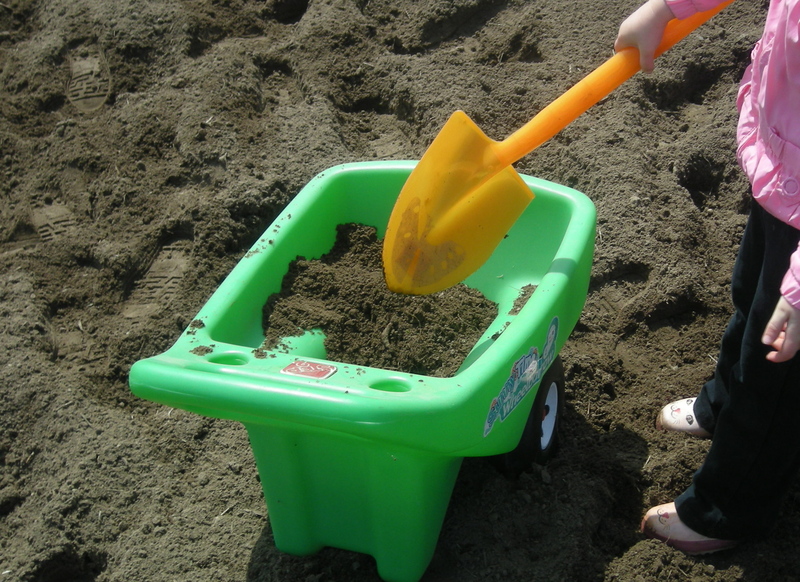 I had picked them up kid sized shovels when I was at TSC an they are a huge hit. A few weeks later the peas are coming up and we just need to make sure they are getting enough water. 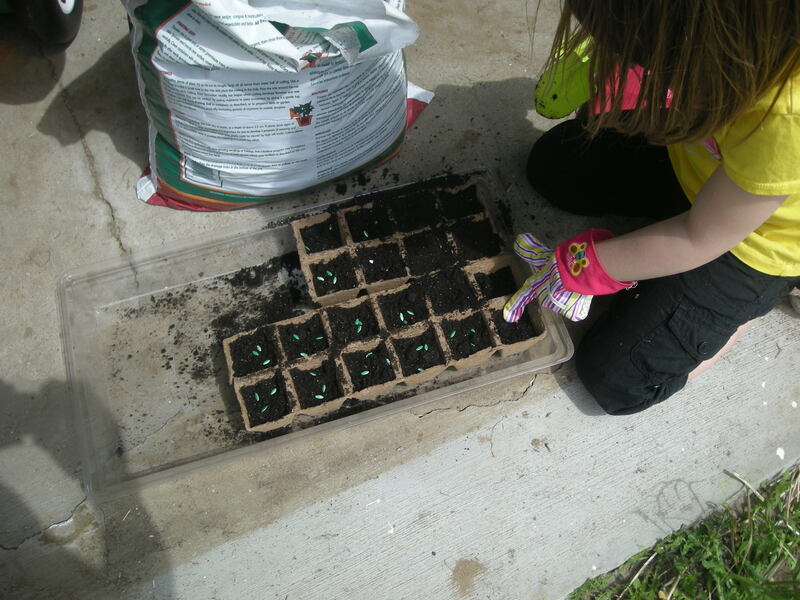 This past Tuesday we planted our pickles and our sunflowers in the greenhouse. We could have planted the sunflowers earlier but we really don’t want them to bloom until the end of August/ beginning of September. Sunflowers blooming is a sign that school is starting and it really confuses the girls when they bloom too early. The other great thing I wanted to share are these great gardening sets the girls got from Aunt Kirsten and Uncle Ben for Easter. They are from Creatology and include a small gardening tote and three tools. 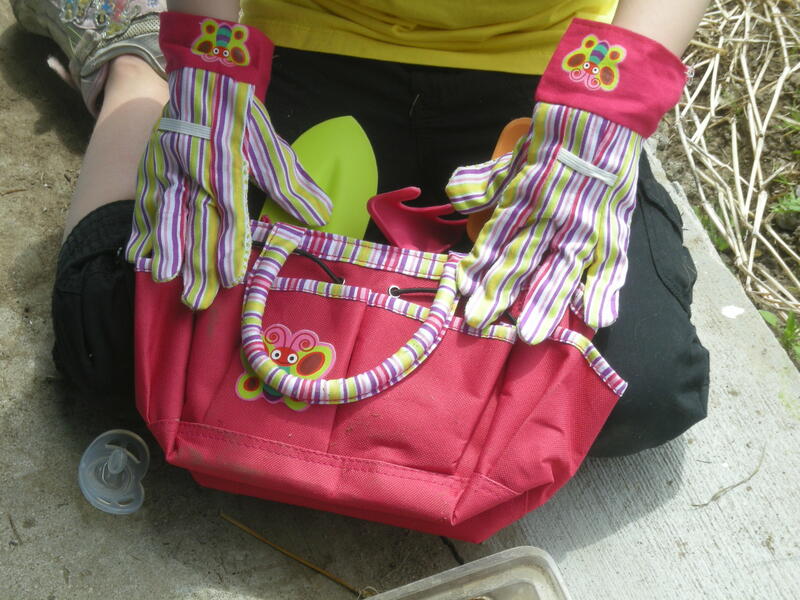 They also gave them the matching gardening gloves which are awesome and were very much needed. I don’t like them handling the seeds too much and these are great at protecting their hands. They fit both of the girls perfectly! Since we moved back to Simcoe from the city just under 5 years ago one of the things I have enjoyed the most is having a vegetable garden. I have always tried to involve my kids in the process in some way, however for the first few years they were usually sitting in a stroller watching me or running around in the backyard. For the past two years Kaitlyn has been old enough to help out a bit, but this year my goals is to involved both Kaitlyn and Eileen from start to finish (Michael will probably sit in the stroller or on the ground eating grass). We started when the Stokes Seed catalog arrived. My dad has always ordered from Stokes, and I remember picking out my favourites from the catalog as a child, so we stick with what we know. For the first time we are trying to start some of our seeds in the greenhouse this season. We own a farm and hence are very luck to have a little corner in the greenhouse the girls can keep our plants. Normally we order our seeds that we sow directly in the garden from Stokes and purchase the rest at a local gardening centre. So we sat down and wrote our wishlist. Peas – I find peas a bit tricky but they are great for kids. They are an early harvest so they give a reward earlier than most other plants. They are the perfect size for little finger to pick, and kids love opening the pods to find the peas. These will go directly in the ground as soon as we have a day warm enough, and dry enough to till up the ground. Brocccoli – This is probably the most popular vegetable in our house. My kids love it! Broccoli can be a bit tricky so we have started this one in the greenhouse. Pumpkins – A no brainer! Every year we grown them. Every year they take over my garden, and part of my lawn. Every year the kids love them! Already started in the greenhouse. Watermelon – Another favourite in our house. Last year we didn’t have much luck with watermelon so hopefully we will have more luck with our seeds we started ourselves in the greenhouse. Onions – O.K. so the kids didn’t pick this one, this is for Mommy. Onions are in almost everything I cook. I chop them up very small and usually the kids don’t even notice them. I like growing onions as I can put them in the root cellar and have them for months. These are already started in the greenhouse as well. Cucumbers – One of the other things I love to do with my oldest, Kaitlyn, is canning. This year we are going to try growing our own pickling cucumbers to make our own pickles. 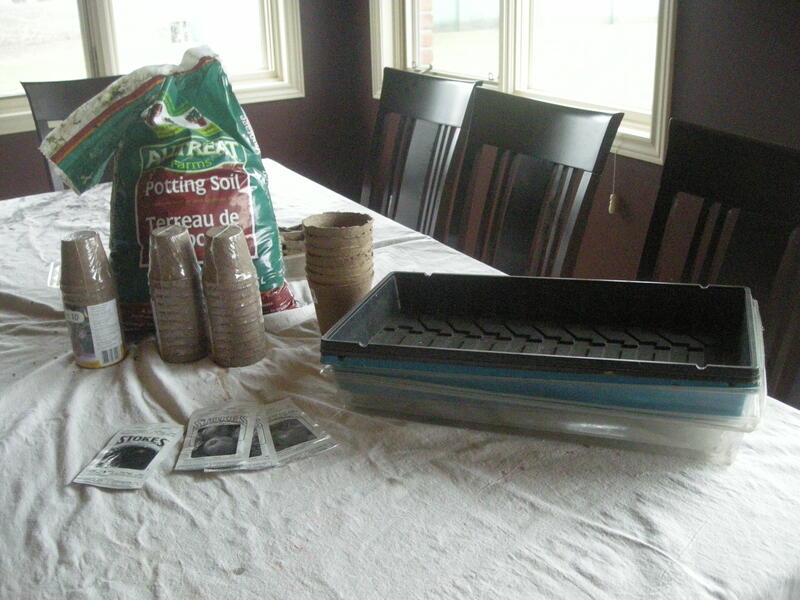 These will be started in the greenhouse May 1st. 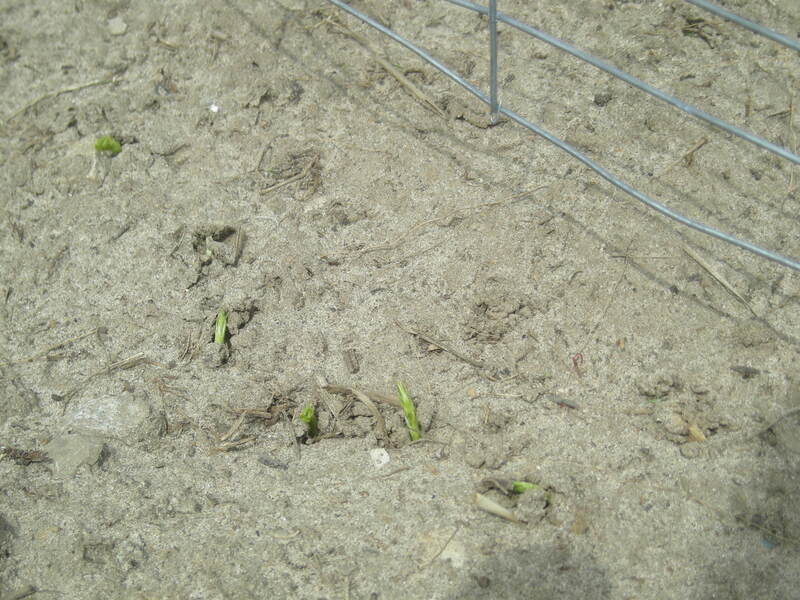 Carrots – These will be planted directly in the ground in June and lets hope the bunnies don’t get them this year. Sunflowers – Every child loves sunflowers. So those are all the seeds we purchased from Stokes. We didn’t want to be too ambitious with our greenhouse plants this year so we will just buy tomato and pepper plants at our local nursery. Last Saturday was our first big planting day. I got out our craft drop sheet and set up all our supplies on the kitchen table (it was too cool to work outside). When planting always read the instruction on your package clearly. 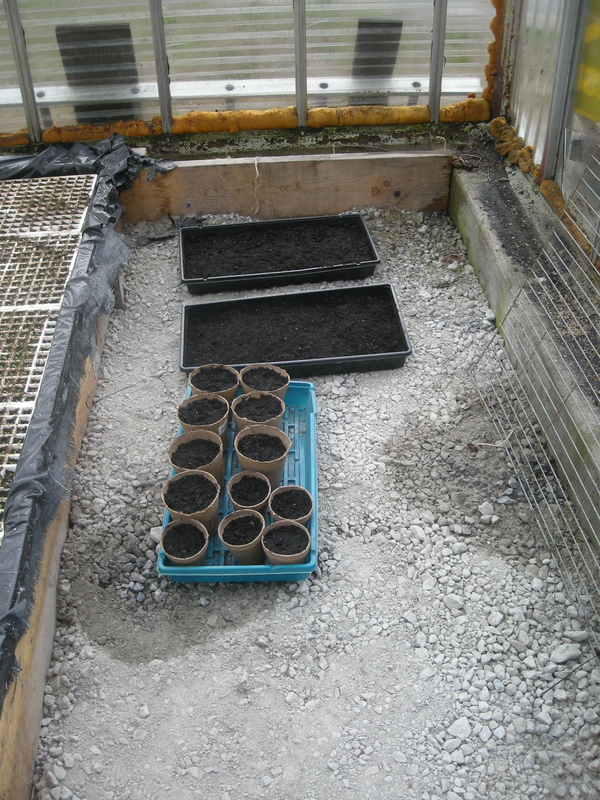 Some of our seeds called to be planted in flats (onions and broccoli) and other were in peat pots (pumpkin and watermelon). 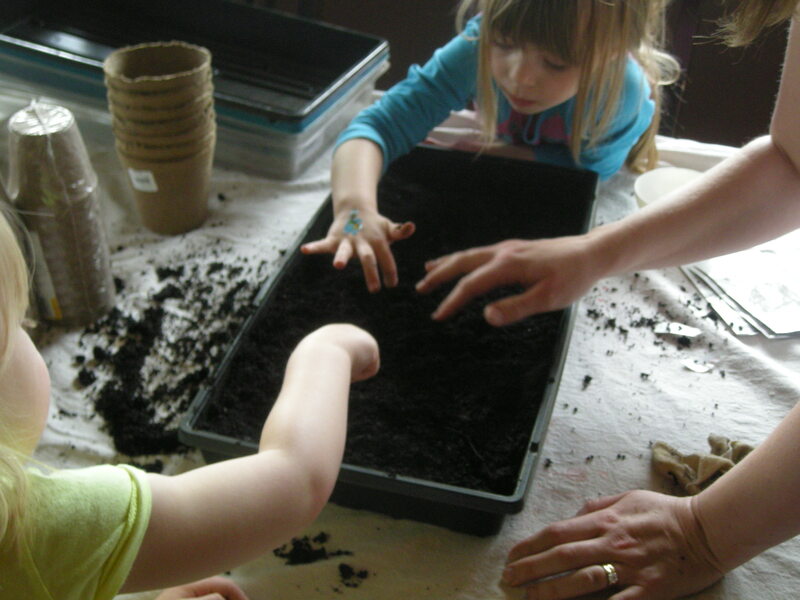 We used a basic, well draining, potting soil mix. After everything was planted we took it over to the greenhouse and every couple day Kaitlyn (with an adult) goes over and water the plants. On Monday night Kaitlyn’s homework was to walk around her neighbourhood and look for signs of spring. Tuesday we took a walk around the house (outside) and we saw shoots for my iris’, daylilies, and tulips and we also saw buds on our flowering cherry and maple trees. Then we had a snow storm on Wednesday, and a snow day, and all our signs of spring were under a foot of snow. 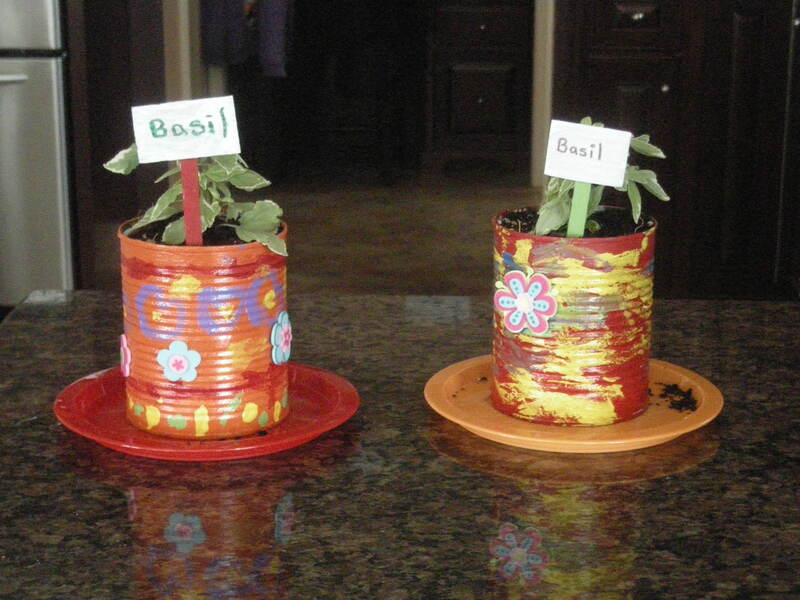 We decided that we needed to harness some signs of spring so this Thursday’s craft was Tin Can Herb Gardens. 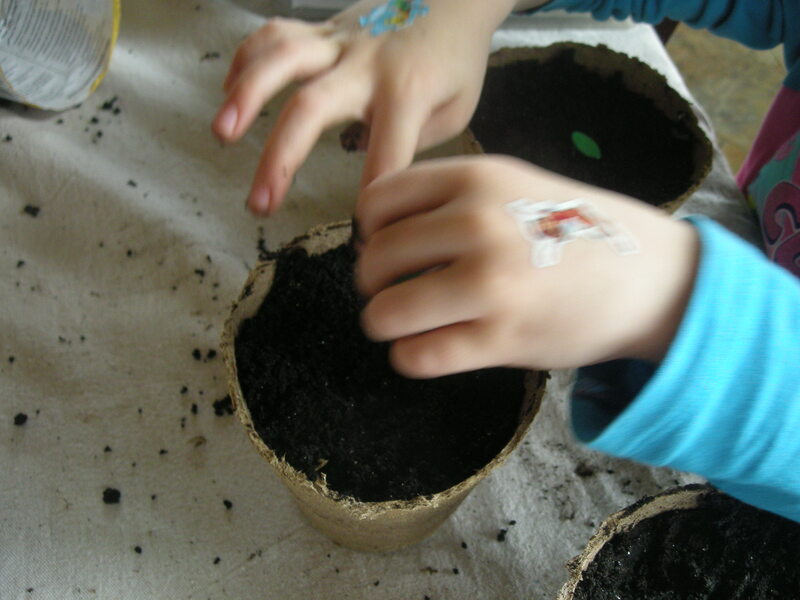 I found the idea when searching for kids gardening ideas, on Kaboose. Due to paint drying time this week’s craft took us both Thursday and Friday to complete. First thing Thursday morning we took a drive to the local Walmart to look for a few supplies we didn’t have. The most difficult thing to find was the liquid Gesso but now that we have it, and have used it, I am hooked. 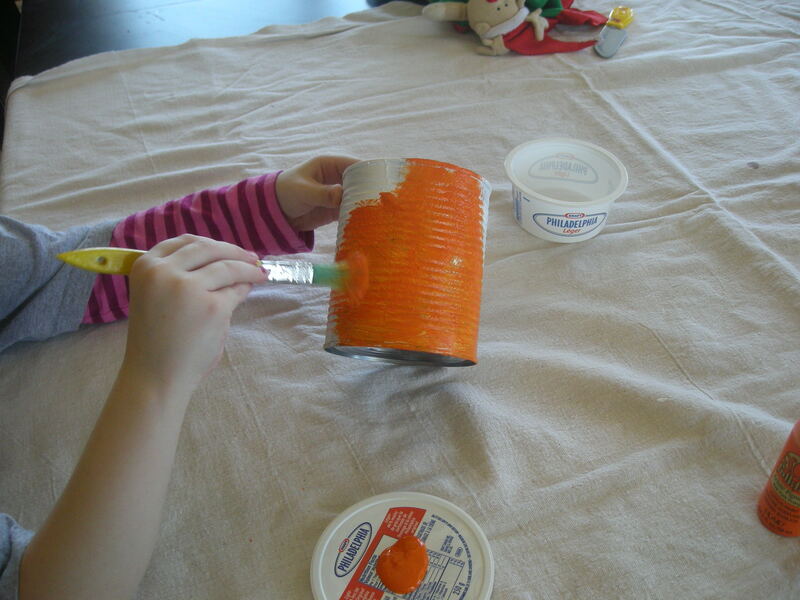 Gesso allows kids to paint objects they normally would not be able to paint – and the paint stays on. 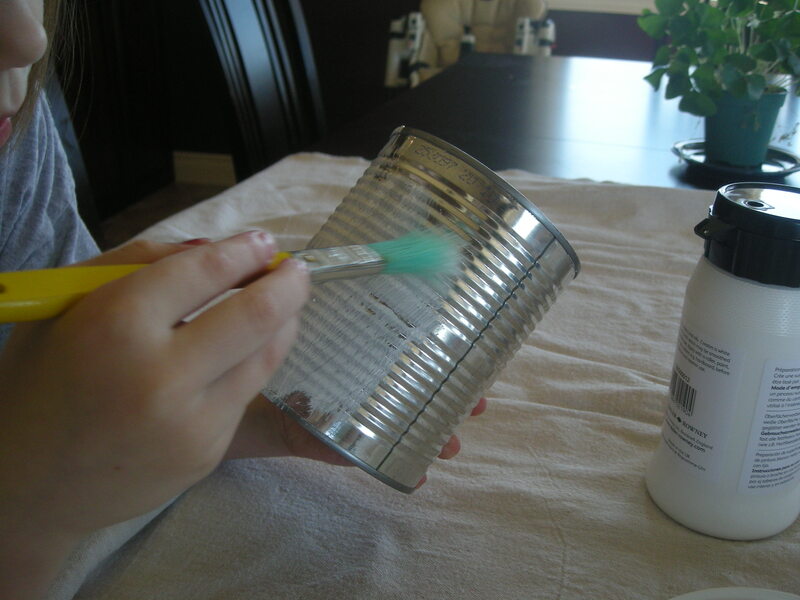 As we were using aluminum cans, paint normally won’t adhere to the can but after one coat of Gesso the girls were able to paint with normal acrylic craft paints and it only took two coats of paint to get a nice solid finish. The Gresso was painted on like you would with any paint. We used simple acrylic paint to paint our cans. Be careful when using acrylic paints as they don’t wash out as easy as tempra paints. We have a drop cloth, purchased from a decorating store, that we always put down when we are painting, and we always wear paint shirts. I would rather the girls just have fun painting and not have to worry about any messes, as they are often part of the fun. After two coats of a solid colour I gave them a pallet with a variety of other colours to decorate. Kaitlyn took her time and created a pattern of hearts, circles, and lines on her can. Eileen loved mixing colours and seeing what she could create. The key is to let it be their designs. After the final drying I brought out some special flower sticker I had picked up for the finishing touches. After they were in bed I took the cans to the garage and sprayed them with an acrylic sealer and let them dry overnight. This is important to prevent any running of the paint when they water their plants. 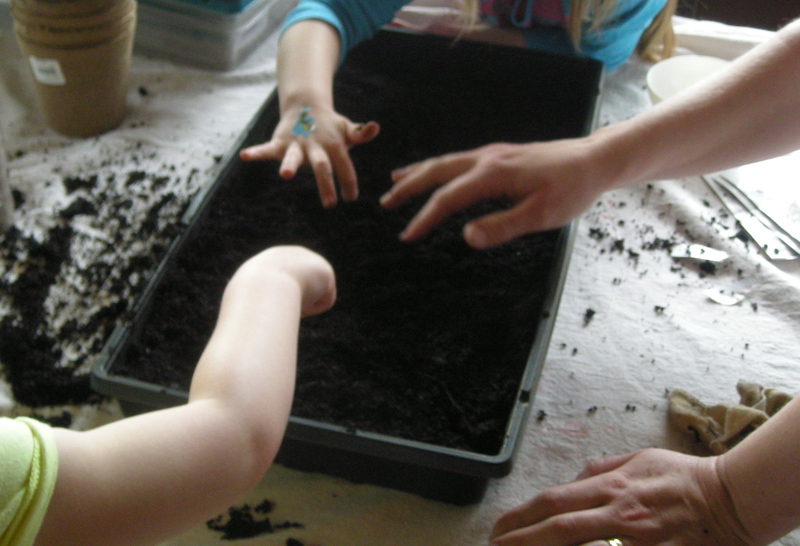 This morning we were planting. We picked up a couple of Pesto Basil plants at our local nursery, Eisings. 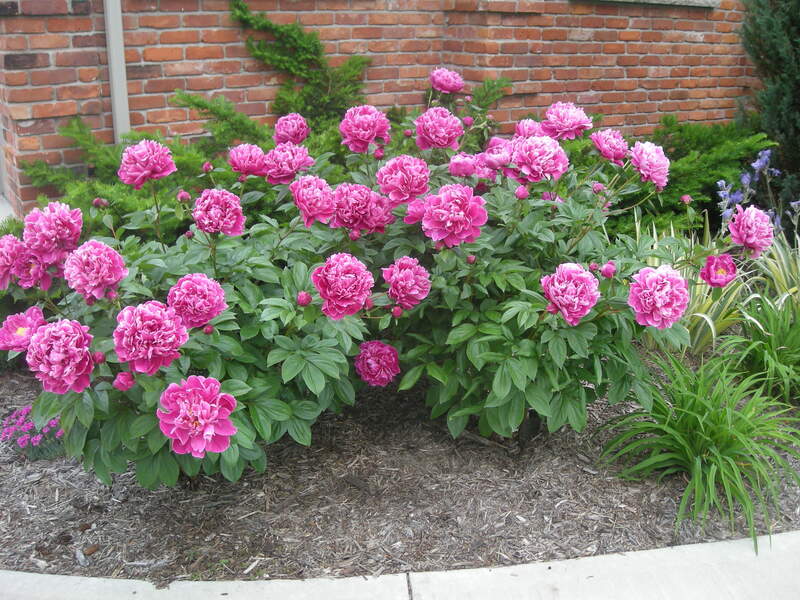 It isn’t the easiest time of year to find plants so we couldn’t be too picky. Ideally it would have been nice for them each to have a different plant but these were the only ones that would fit in our cans. We used 28 oz. tomato cans. It gave them a larger work space an there is more room for the roots of their plants to grow. After transfering the herbs to their beautiful cans the girls each made a small stake out of a popsicle stick to label their basil. Voila!